If you swear by seafood and love gorging on a sumptuous platter of crab quite often, it might be time for you to find out if you can continue having your favorite dish when you are pregnant. Crabs are considered to be a safe variety of shellfish that may be eaten during pregnancy in measured amounts . 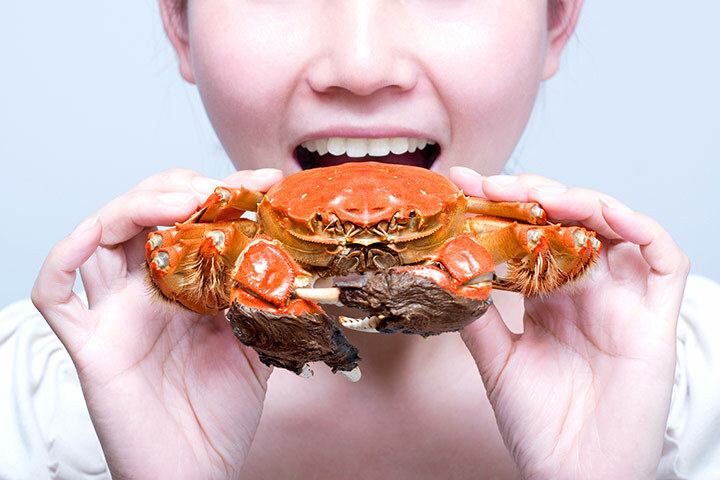 Raw or undercooked crab is not safe to eat as all varieties of shellfish contain harmful bacteria and parasites that may trigger serious conditions like salmonella, toxoplasmosis, and listeriosis when eaten without cooking well. These conditions may also affect the fetus, increasing the risk of congenital disabilities or even leading to a miscarriage [1,2]. Many countries have actually put a restriction on eating smoked crab meat while pregnant due to such risks [1, 3]. Sometimes, crabs and other shellfishes have been found to cause allergic reactions during pregnancy, even if you did not have an allergy to these prior to your pregnancy. In such a case, make sure to avoid them. Eating 12 ounces of seafood in a week is considered safe . This may comprise of only crab or can be a combination of crabs and other shellfishes. But, make sure that a single serving does not exceed 3 to 6 ounces . Crabs are said to have low levels of mercury, with the king variety dominating the list [5, 6]. Besides this snow crab, Dungeness crab, and blue crab are also considered good to eat [7, 8]. Avoid or at least limit eating crab legs (especially king crabs) since they have a high sodium content which may affect your health adversely [15,16]. Omega 3 plays a significant role in brain and vision development of the fetus . As three ounce of cooked crab contains 351 mg of omega 3 fatty acids, you can consider it while fixing your diet for the week . Pregnant women have a daily requirement of 40 to 70 grams of protein with 3 ounces of crab making for 16.45 grams of it [11, 12]. This vitamin plays a pivotal role in neural tube, spine and brain development, as well as helps to improve your mood during this time . Crab meat (3 ounces) contributing towards 9.78 micrograms of the daily requirement of this vitamin is a beneficial dietary option. Fried and made into cakes and wontons. Cooked to prepare pastes, dips, and curries. Boiled to make soup recipes like a bisque. Steamed and made into salads as well as rolls. Boil the crabs before frying or cooking to steer them clean of all bacteria and germs. Do not use raw or undercooked crab while preparing sushi, rolls or salads. When going for the canned varieties choose pasteurized, or preheated crab over the cooked or cold ones as the former have lesser chances of bacterial contamination . Crab should not be harmful during pregnancy if you take all the precautions before eating it. However, if you have a stomach upset, severe digestive disorders or any other discomfort after finishing a meal of crabs, talk to your doctor at once.